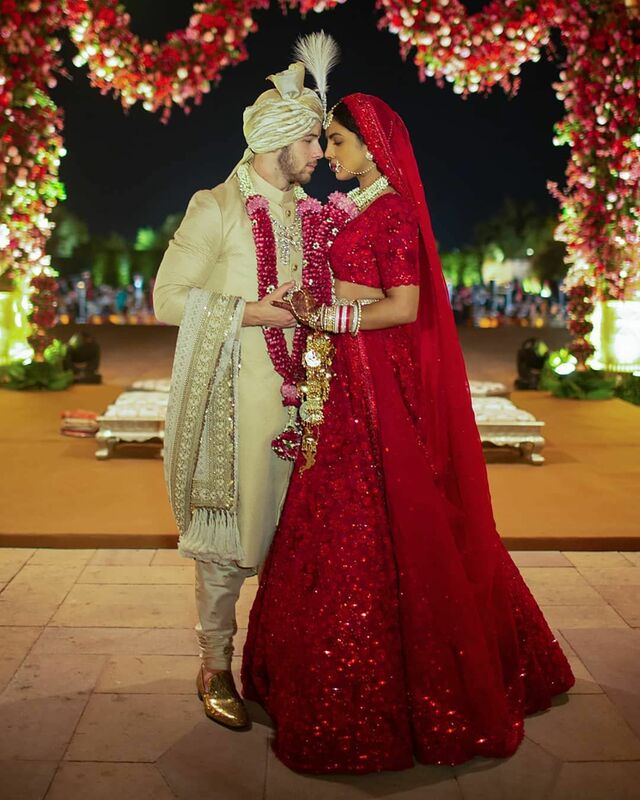 Priyanka Chopra and Nick Jonas wedding last month in Jodhpur was one of the most talked about celebrity weddings and people still can't get over it. More and more pictures from her wedding keep surfacing on the internet and keep the excitement of the lovebirds' wedding alive. In the most recent set of pictures to appear on the internet, Priyanka Chopra looks like a surreal Indian bride, a vision in red. She is definitely one of the top contenders of the most beautiful brides we have ever seen. Take a look! Priyanka Chopra's wedding lehenga designer Sabyasachi posted unseen pictures of the bride from her wedding day. The sheer beauty of the bride, PeeCee and of the dress is making us gasp. Priyanka Chopra wore a rose-red lehenga and choli. Her minimal make-up and the gorgeous ornaments and the grace with which the Bollywood actress carried herself made her one of the most beautiful brides we have ever seen. A Vision In Red Her breath taking wedding lehenga - choli took 110 embroiderers and 3,720 hours to create. According to Pinkvilla, Priyanka had once shared, I always knew I wanted a red traditional silhouette for my wedding but Sabya brought in incredible French embroidery to the mix and with incredible jewelry and Western-inspired veil it was just such an amalgamation of who I am. A Sabyasachi Masterpiece The beautiful lehenga was hand embroidered with sequins hand made organza flowers French knots and sparkling Siam-red crystals. The much sought after designer, Sabyasachi had shared on his Instagram, While some bride stay rooted in purist tradition, others aspire to re-interpret it to suit their personalities. Priyanka Chopra's neo-traditional bridal lehenga was the result of an active collaboration between the designer and the bride. The Kanauj Rose lehenga remains a Sabyasachi house classic for women who like to marry global tradition with Indian heritage.